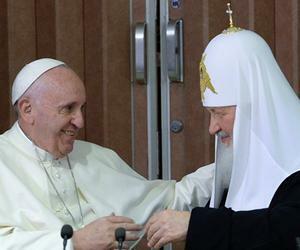 Nearly 1000 years after the Eastern and Western branches of Christianity split apart, the meeting at an airport terminal in Cuba was the first ever between a Roman Catholic pope and a Russian Orthodox patriarch. Pope Francis and Patriarch Kirill embraced and kissed one another three times on the cheek as they met in the wood-paneled VIP room at Havana's José Martí International Airport. The two church leaders then proceeded to a pair of straight-backed chairs turned at angles. After two hours of talks, described by Francis as "open and frank", in the presence of host President Raul Castro, the two leaders signed a historical agreement. Kirill spoke about the needed cooperation between the two churches that can define the future of Christianity throughout the world. "Today both churches can work actively in defense of Christians from all over the world and work responsibly in a joint way so there would be no wars, for life to be respected everywhere. To strengthen the bases of morality inside families and society"
Pope Francis stressed the common ground by saying that "We talked as brothers, we are baptized in the same faith, and we are both bishops", but acknowledged that there is still a long way ahead for them to achieve a true unity. Francis thanked the teams from both churches that worked for a long time in the draft of this document. He also thanked Cuba, its people and its President for hosting this historical meeting, and added that if Cuba "keeps going this way, it will become the world capital of unity"